We are located in Ramsbottom which is a small town in the North West of England, It comes under the Metropolitan Borough of Bury in Greater Manchester, with outlying areas in the Borough of Rossendale in Lancashire. It is located along the course of the River Irwell and the M66 motorway, in a deep valley amongst the West Pennine Moors, 3.9 miles (6.3 km) North-Northwest of Bury, and 12 miles (19 km) North-Northwest of Manchester. We currently have 5 members in our club which range in age from 30-60+ so there really is no age limit and we are always looking to expand our membership. So if you have an interest in Model Railways or even just Railways then why not pay us a visit. Our members (L-R):- Daniel Jones(Secretary), Alan Garside(Chairman), Adrian Hall, Roger Wilson(R.I.P), Alex King and Keith Cragg(Treasurer). We are also a member of the North West Model Railway Club’s Association and are proud to join with other model railway clubs and groups from the North West. Please have a look around our website by using the menu above, and if you have some spare time then please leave us a message on the Your Comments page. It is always nice to hear your views and comments these can help us develop the site and improve things. We also have a couple of pages for the group on Facebook and Youtube. These have some pictures and videos which are well worth viewing. Please click the images below to visit them. 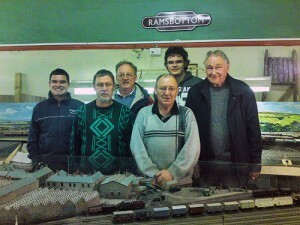 Thank you from Ramsbottom Model Railway Club.